Sam KDC, Oak, Lyterian, Equinox, Skanna and more. This set was re-recorded after the event. I am now resident for Soul:ution. 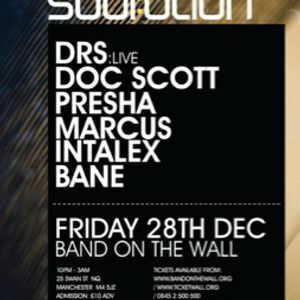 The line up this month: DRS (Live), Doc Scott, Presha & Marcus Intalex. Great night as always. Hope you enjoy the mix... See you on the 25th January @ Band On The Wall, Manchester for Dub Phizix, Commix, Marcus Intalex, MC DRS & myself.